Elitehost Review 2019: Is Elitehost a Good Hosting? Elitehost has been providing website hosting since 2005 with SSD storage. The plans are well-priced and have a good uptime guarantee, the only downside is the lack of support for advanced programming languages in the shared hosting plans (you need to upgrade to VPS for that). Elitehost, based in Johannesburg, South Africa, has been providing website hosting since 2005. With servers co-located in multiple data centers around the world, its website is available in English. Elitehost co-locates its servers in data centers around the world; there are two centers in South Africa, one in the U.K., one in Germany, and one in the U.S. It’s also excellent to see a 99.9% uptime guarantee, which is backed by compensation (unlike many other companies). As well as SSD storage for faster disk read/write speeds, the servers run on CloudLinux, which means your data is isolated from your neighbors, and LiteSpeed Web Server for fast performance. It’s clear that Elitehost is offering premium hosting services. There are two tiers of plans – business and personal – which both include comprehensive resource allocations coupled with a premium one-click installer for more than 250 programs and a website building tool for beginners. For experts, there are all the usual features you’d hope for such as phpMyAdmin, MySQL, and support for all versions of PHP. 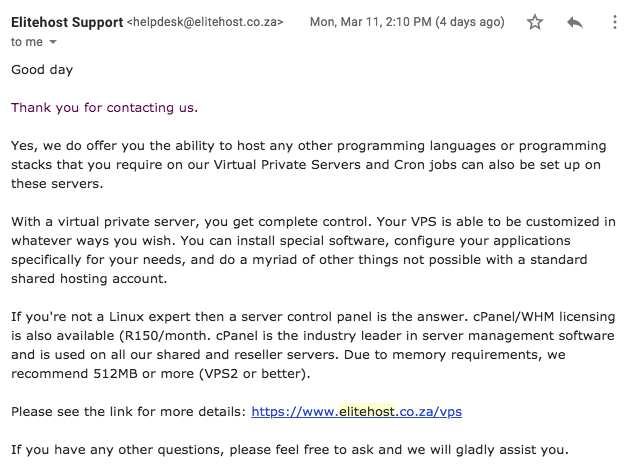 However, if you’d like support for other advanced languages and Cron jobs, you will need to upgrade to the VPS plans. The plans are pretty well priced, especially given the level of features and resources included. You also get a free Let’s Encrypt certificate and domain name (in annual plans only), so overall, it’s generous pricing. You can purchase the plans in one, three, six, and twelve-month terms, with a small discount and a free domain if you buy one-year upfront. There’s a 30-day money-back guarantee on all plans except VPS, which comes with a 15-day guarantee. Customer service is available by phone, email, ticket, and live chat. Uniquely, there’s compensation in the event you don’t get support from a member of staff within 24 hours. In my experience, I sent an email via the offline live chat window at around 3:00 PM in South Africa and I got a response on the same day. The reply was detailed and answered my question in full. If you don’t want to get help from a team member, there’s a help desk with documents and tutorials for your review. Elitehost has a “strict 3-stage backup procedure” which includes daily backups, RAID 10 hard drive array, and daily off-site backups. It also has several performance-enhancing features and generous resource allocations. It’s hard not to like Elitehost, it’s just a shame you need to upgrade to get support for advanced programming languages. Buy premium hosting at Elitehost! Wondering how Elitehost stacks up against other Web Hosting companies? Enter any other Web Hosting company and we will give you a side-by-side comparison.